My first visual impression on the phone was decent, although it does not exactly have that “wow” impact on me. The front has a full glass finish surrounded by a piano-black trimming, while the rear cover plate is coated with a rubberized-like material. The glossy buttons felt a tad cheap-skate though, probably a biased perception after using Q9h’s keyboard for the last 5 months. The WM6 professional phone comes with the usual suspect features, such as micro-SD slot, volume control buttons. Like Q9h, the qwerty keyboard has a few function keys that are mapped to camera, messaging and GPS applications by default, making quick access to one’s favourite applications a snap. As I turned on the phone, I was greeted by a slightly customised home screen. It is not fantastic although it is still better than the dull looking Windows Mobile’s Today screen. I ended up installing PointUI software, which is by the way, one of the better looking and functional shell program you would find for a Windows Mobile device. Like many other smart phones, Samsung completely ignored the needs of bilingual users like yours truly, where the ability to read and write English and Chinese text is becoming a necessity than a nice to have feature. Luckily, there is third party software available, PlumSIP, which was not available for my previous smartphone platform. The Microsoft bluetooth stack, as expected, offers limited bluetooth management functionality although the essential bluetooth profiles such as A2DP, PAN, etc are available. The background noise level, when connected to a bluetooth handsfree car kit, is acceptable but my previous Q9h did a better job. Qwerty keyboard layout, as a result of a narrower phone design, makes texting a tad challenging. Luckily for me, having own the likes of Treo 500v and Dopod C730 previously, helps to transition alot. Thus, it didn’t take too long for me to get used to the “squeezy key buttons”. What really annoyed me is the change of the keyboard layout, which had some of the basic keys like “Return” and “Cap-lock” buttons re-positioned. So I always ended up hitting the “Enter” key when trying to type a capital “A”, for example. Can’t the manufacturers agree and standardize on a common (basic) keyboard layout in the first place? What really caught my attention is the optical sensor in replacement of the conventional 4 way d-pad. The optical sensor can be used in two different way; a mouse function, or 4 way navigation. All these are achieved through swiping of one’s finger on the sensor to simulate a mouse movement or a d-pad click. Without having a physical touch of a d-pad, or a mouse, I had my reservation on how this ‘revolutionary’ navigation control would be effective. Having used to Windows Mobile Standard smartphones for the last 9 months, I also have the apprehension to switch to a touch-phone because the former had the entire user interface designed based on keyboard navigation. I find it counter productive when you have to switch between keyboard and touchscreen just to access a certain phone function. With the mouse function, it totally eliminates the need for me to use my fat finger to ‘poke’ on the screen. However, not all applications respond well to the new mouse function. On the other hand, the 4-way navigation actually does a good (navigation) job very well most of the time. Thankfully, someone created a mouse toggle utility so all I need to do is to map a hardware short-cut key to toggle the control mode depending on the need. Now I can switch to mouse function with just a key touch, if the keyboard becomes a pain to navigate for that specific application. The other big plus I have observed is the phone’s excellent file system and graphic processing capability. Running Garmin Mobile XT with a 3D map, is a breeze, and there was no sign of lag at all. The software could render 3D view of the map during zoom-in and zoom-out without any glitches, something that my previous Q9h could not afford to do. Hardwarezone and Zol.com.cn had previously done some benchmark comparison, and Samsung i780 outperforms the like of HTC Cruise and iMate 8502 in various department (File system, CPU, GPU, etc). 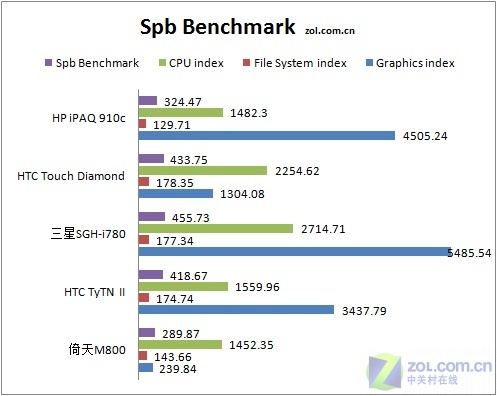 Not even the HTC Diamond or Tytn II come close to i780, if the following SPB benchmark report were to suggest anything. In a nutshell, despite the mediocre offering in some departments, i780 has already starting to win my heart due to its excellent optical mouse function and graphic processing capability. The two essentials are enough (for now) to make the whole experience a notch higher than some other “bare-bone” WM Professional phones you would find in the market. Samsung SGH-i780, certainly scores more than the literal meaning of its chinese brand name, “三星”, which means “three star” in English. Even though I mentioned before that Omnia totally change my perception of “physical keyboard is a must for a phone”, I don’t think I am ready yet for a keyboard-less phone. Plus, it’ll be expensive to get it at its launch date and I don’t want to spend too much considering that this (in this case i780) will be my 4th gadget phone in the last 10 months. Lastly, I hope to get my hands on one demo unit of another phone in the next few weeks. That should do the trick of giving me something to look forward to. The most annoying thing with the i780 is that it does not support voice dialing via bluetooth. It makes the car hands-free feature almost useless since to make a call I have to reach for the phone, pronounce the name, put the gadget back to the craddle and wait for the connection. Just stupid!